Calling all tea lovers! Our vintage teapots are all up to £10 off. For 12 hours only. A flash sale for tea lovers! If you fancy brewing up your fave hot beverage in a fun vintage teapot then now’s the time to snap one up in our 12 hour flash sale. 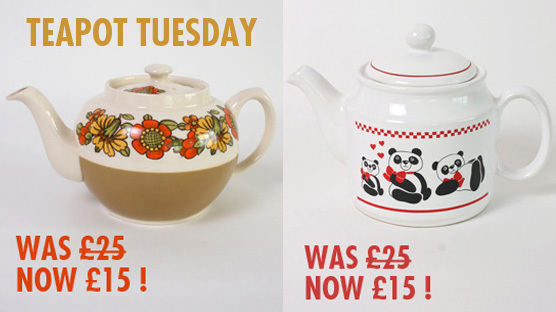 Until midnight tonight, all our teapots which include cat shaped, panda printed and pretty flower motif ones are up to £10 off. Woooo!